The Facebook post could be a bit misleading if you assume Benicia is among the 10 California Communities identified in the KQED story. But if you dig in a bit, you find an interactive map. 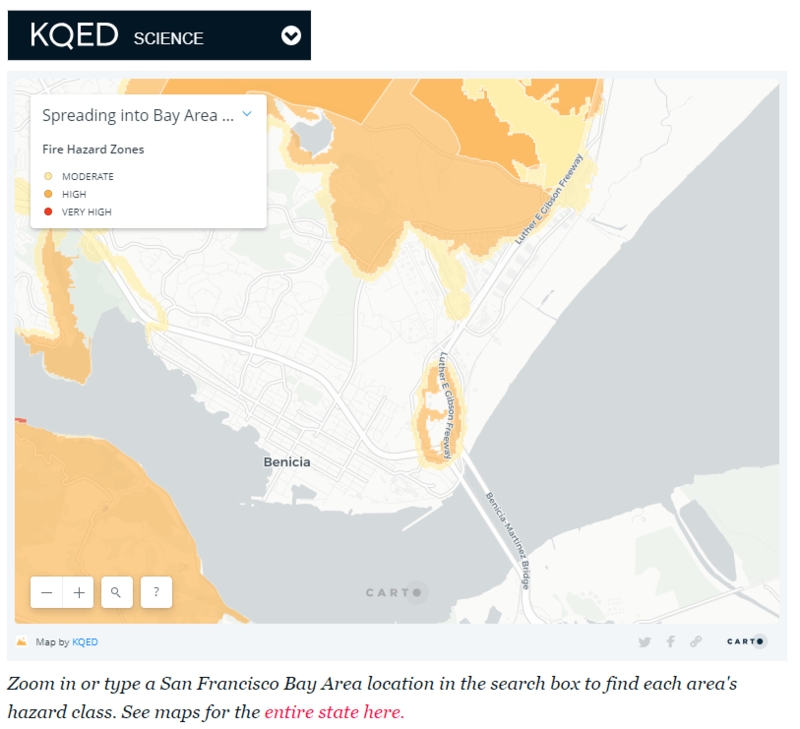 Drilling down into this map, you find Benicia’s Valero Refinery surrounded by a “High Fire Hazard Zone” (dark orange). 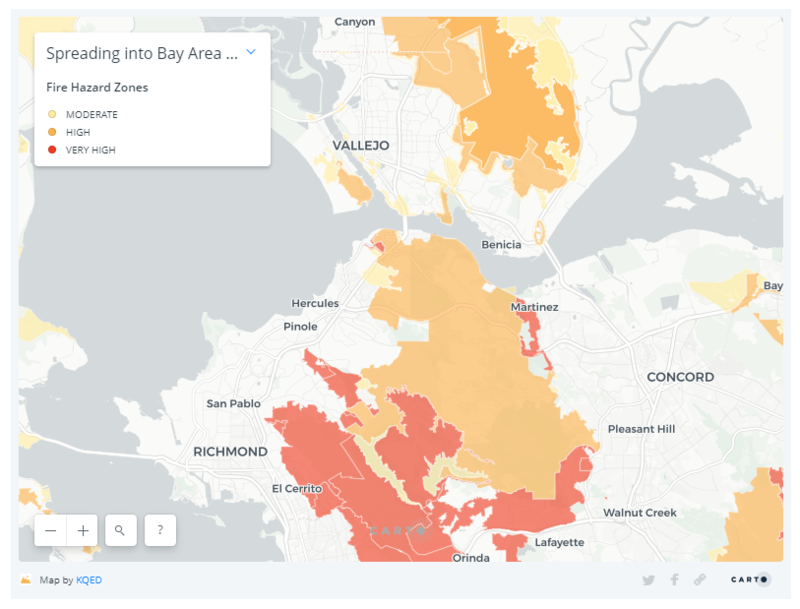 Expand the map a bit and scroll around the Bay Area and you find that refineries in Martinez and Rodeo are located near VERY High Fire Hazard zones (red). This coming Tuesday, April 16, Benicia’s City Council will consider a staff recommendation to adopt an updated Emergency Operations Plan (EOP). Someone needs to do a careful search of the proposed plan to determine readiness for a very real wildfire threat to the refinery. Are adequate preparations in place for cutting back combustible materials in and near Benicia’s Industrial Park? Will adequate watch be undertaken by the two fire departments (Valero and City of Benicia) during California’s expanding fire season? Are plans to fight wildfire in the eventuality of an outbreak detailed, robust, and well-rehearsed? Of course, the lives of refinery workers and nearby Industrial Park workers, and indeed the lives and well-being of all Benicia residents are put at risk as climate change increases the odds for wildfires in our beautiful part of the world. Vigilance is required! 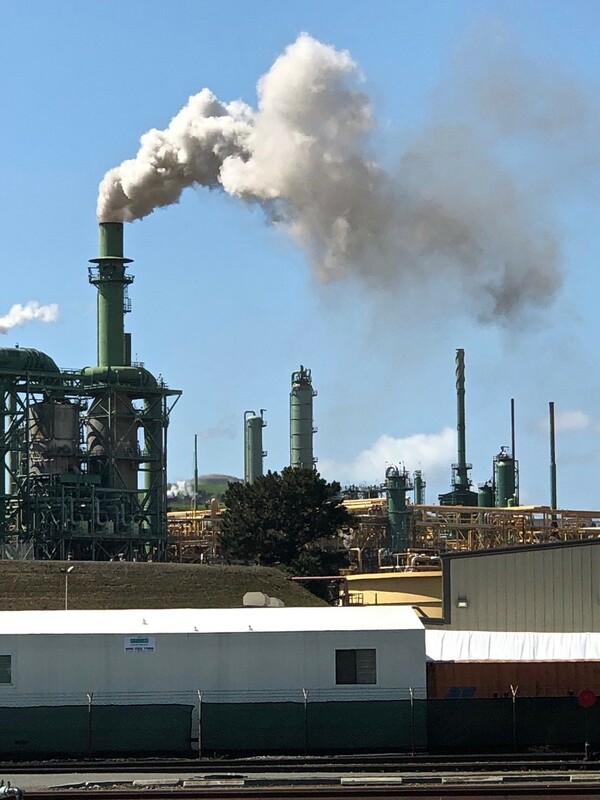 The Benicia Independent learned yesterday that Valero Benicia Refinery will remain in “partial shutdown” until early or mid-May. The partial shutdown has already raised gas prices in California. How will another month offline affect consumers’ gas prices?